What happens when a dear friend requests a spot-on replica of the utterly perfect cupcakes her mom used to make－minus the dairy and gluten? You figure out a way, of course! Emma is one of my son John’s oldest and dearest friends. She’s the youngest of four girls, the oldest of whom babysat for our family years ago. She’s the daughter of longtime family friends, and quite coincidentally, her aunt was my college roommate. As if that wasn’t enough connection, Emma grew up in the house that formerly belonged to my husband’s grandparents. Small world indeed! Less than a year ago, Emma’s world was rocked when her mom, Ruth, died after a long, courageous battle with cancer. When someone passes away, so many of us want to help. We drop off meals, in hopes that they will assuage some of the pain, but we know that no amount of soup or baked oatmeal will truly fill the void. In talking with Emma as she struggled to piece together a new normal in the months following her mom’s passing, it struck me how so many of her fondest memories with her mom were so intimately linked to food. 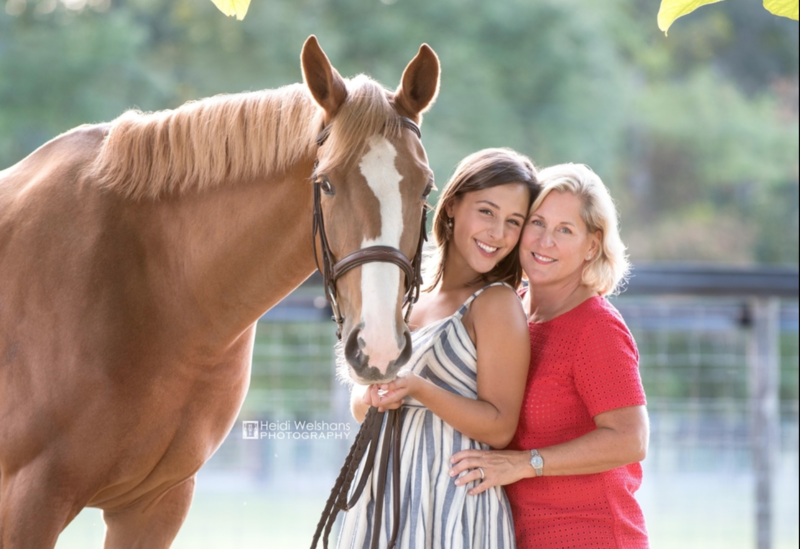 Fried green tomatoes and coconut cake were staples when mother and daughter traveled to Florida for Emma’s equestrian competitions, and they led to talk about Ruth’s southern upbringing. On ordinary school days, the dinner menu often included “Emma’s Favorite Pasta” – the actual name in Ruth’s recipe Rolodex and basically a homemade version of Hamburger Helper. When Emma’s dad was out of town, there would most assuredly be a taco or pancakes-for-dinner night, the latter of which were dotted with chocolate chips and served with a side of sausage. “Egg Wednesday” was a recurring theme because Ruth figured that Emma needed a good protein-packed meal for the middle of the school week. It was Emma’s favorite breakfast day. When Emma told me this, I could literally feel her mother’s love. Ruth also loved to bake, and many of Emma’s fondest memories are from the times she baked with her mom or simply sat in the kitchen and talked as she watched her mom whip up a favorite treat. Ruth was also a great storyteller, and as they cooked, Emma always listened intently and felt like she was reliving her mother’s memories with her. Emma told me recently that she now finds herself returning to certain foods in an effort to bring back a part of her mom that her whole family misses. 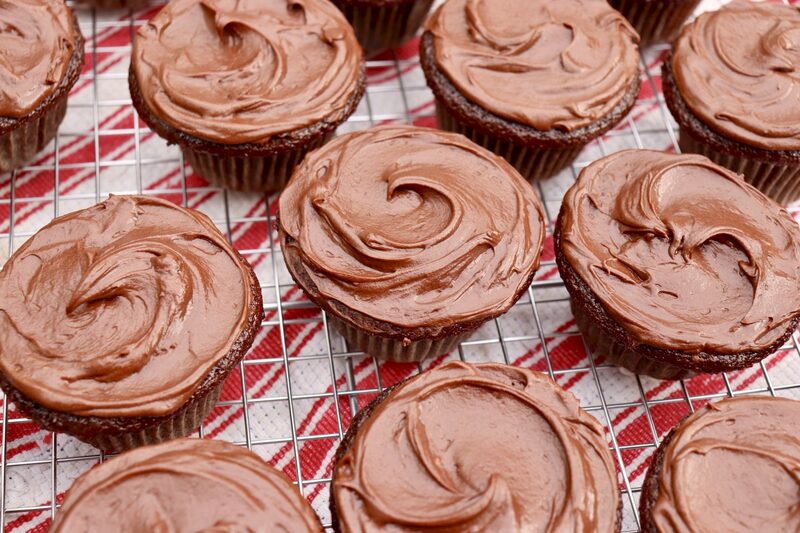 Classic chocolate cupcakes were, without a doubt, Emma’s most-loved dessert of all time. During her mother’s illness, however, Emma developed severe intestinal issues and for medical reasons was forced to remove dairy and gluten from her diet. Recently, Emma asked me if we could possibly create a dairy- and gluten-free cupcake that tasted just like her mom’s. In a split second, I answered yes. Recreating a taste that linked Emma to a treasure trove of memories with her mom was essential. Failure was not an option. Luckily, I had previously mastered a gluten-free variation of a much-loved Fulton family chocolate cake. To accommodate the dairy-free need, however, we had to replace two baking staples: milk and butter. Almond milk allowed for successful elimination of the dairy in the cupcakes. (I opted for almond milk for the first go-round, as it’s one of the most widely consumed plant-based milks.) I bought vanilla almond milk by mistake, left the vanilla extract measurement the same and thought the flavor of the cupcakes was outstanding. A few more details follow in the recipe, but I’m nearly certain that other plant-based milks would work as well. My younger son returned from swim practice as Emma and I were finishing up and promptly asked for a “sample.” He’s a reliable taste tester because he notices subtle changes－and he has enjoyed this recipe many, many times in cake form. Conveniently, the cupcake batter mixes up in a single bowl with basic pantry and refrigerator staples. More importantly, Emma approved. Aside from spending quality time together, my singular goal was to create a cupcake that would take Emma back in time… to her own kitchen, listening to her mom tell stories, smelling the sweet aromas and ultimately sinking her teeth into chocolate perfection. At the end of the day, the most important ingredient in Emma’s Favorite Cupcakes was suddenly so obvious. Weighing the ingredients assures proper measurements. If you don’t have a kitchen scale, make sure to fluff up the flour and cocoa powder before spooning them into the measuring cups (rather than using the cup as a scoop, which compacts them) and leveling with the straight edge of a knife. We consider these to be cupcake perfection, whether following the standard recipe or using the dairy- and gluten-free adjustments. 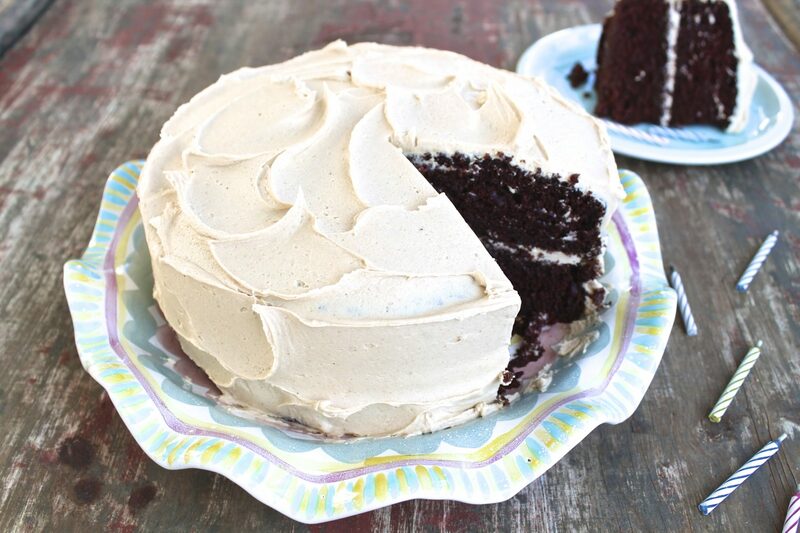 The chocolate frosting is silky smooth and so easy (and you'll likely want to use it on other cakes), but you may absolutely use your flavor of choice! Combine the dry ingredients in a large bowl. Add the eggs, milk, oil and vanilla. 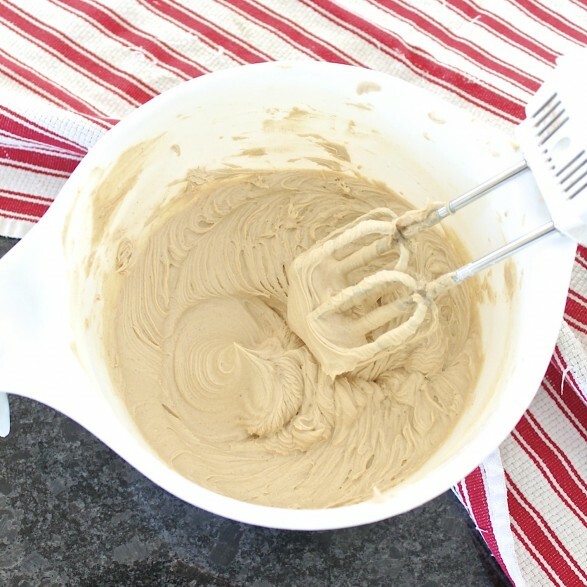 Beat with a hand or stand mixer until completely mixed, 30 seconds to one minute. Stir in the boiling water. The batter will be thin. Bake for 18-20 minutes, give or take a few depending on oven, or until the center is just cooked through. (If you want to be really precise, the internal temperature should be between 200 and 205 degrees F; 18 minutes is perfect in my oven.) Also keep in mind that dark-coated baking pans tend to cook a bit faster than light-colored pans. 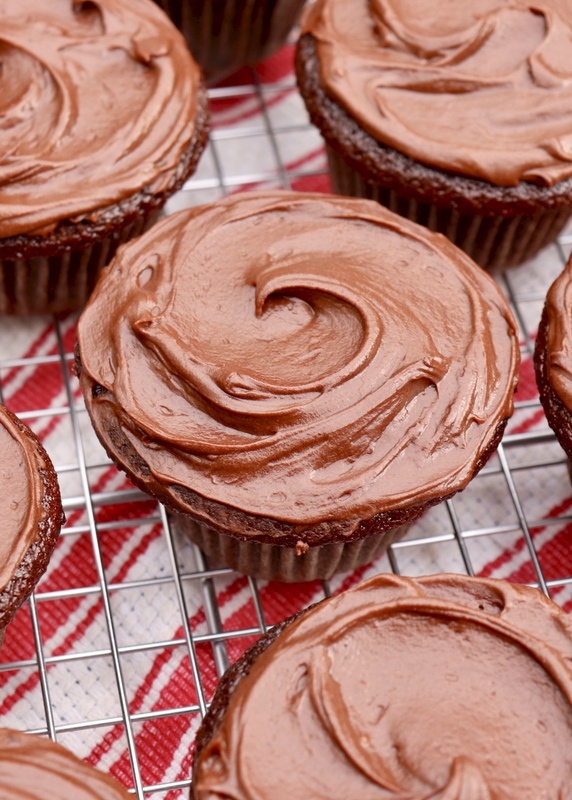 The trick to cupcake perfection is to remove them from the oven when they are just cooked through, so check on the early side to avoid overcooking. Cool the cupcakes for about 10 minutes in the pan, and then remove to a baking rack and cool completely. Frost as desired. In a mixing bowl (a quart-size Pyrex measuring cup also works well with many hand beaters and the butter or Earth’s Balance can be melted in it first), stir the cocoa powder into the melted butter. Stir in the vanilla, and then add half the sugar and half the milk. Stir to partially incorporate (I stir with the turned-off beaters – this prevents a powdered sugar dust cloud), and then beat on medium speed, adding the remaining sugar and enough milk to achieve a smooth, creamy consistency. If necessary, add more milk by the scant-teaspoon – a little goes a long way. Frost the cooled cupcakes and enjoy! *I usually reach for 2% milk for the cake recipe (although nonfat and whole may be used), but for Emma’s dairy-free cupcakes we used unsweetened vanilla almond milk with excellent results. I feel fairly certain that soymilk, coconut milk (the carton kind, not canned), cashew milk or one of the blends (like Silk’s almond-coconut milk) would work well, too. I’d choose an unsweetened variety (although sweetened wouldn’t be a deal breaker), vanilla or plain as preferred. **When using Earth’s Balance instead of butter, I find the frosting to be slightly looser at first. If necessary, refrigerate it to firm it to desired frosting consistency, about 30 minutes or so. Advance prep tip: Frosting may be prepared up to several days in advance, covered with a piece of plastic wrap pressed onto the surface and refrigerated. Before spreading, bring the frosting to room temperature and give it a good stir. Make as a cake: The batter can be poured into 2 (9-inch) greased cake pans and baked at 350 degrees F for 25-30 minutes or until just cooked through the center. 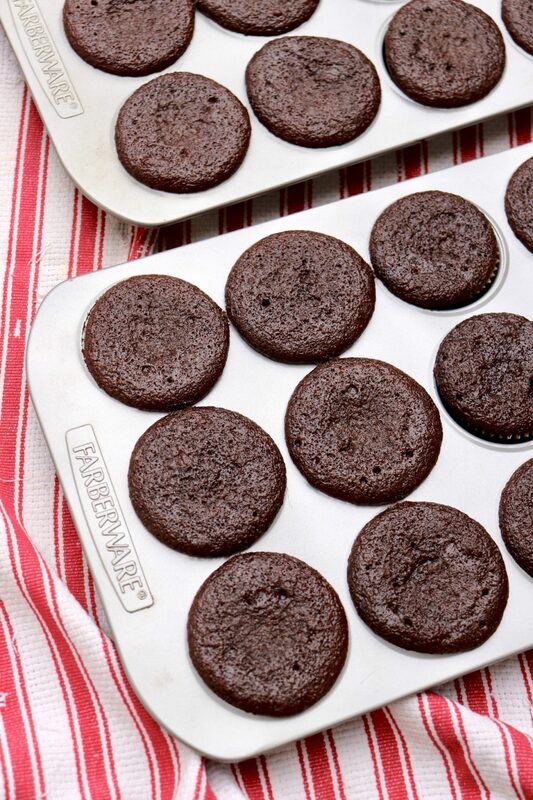 Cool the cake in the pans for 10-15 minutes and then remove to baking racks and cool completely before frosting. The batter would work with a 9×13 pan as well; baking time would be somewhat longer. 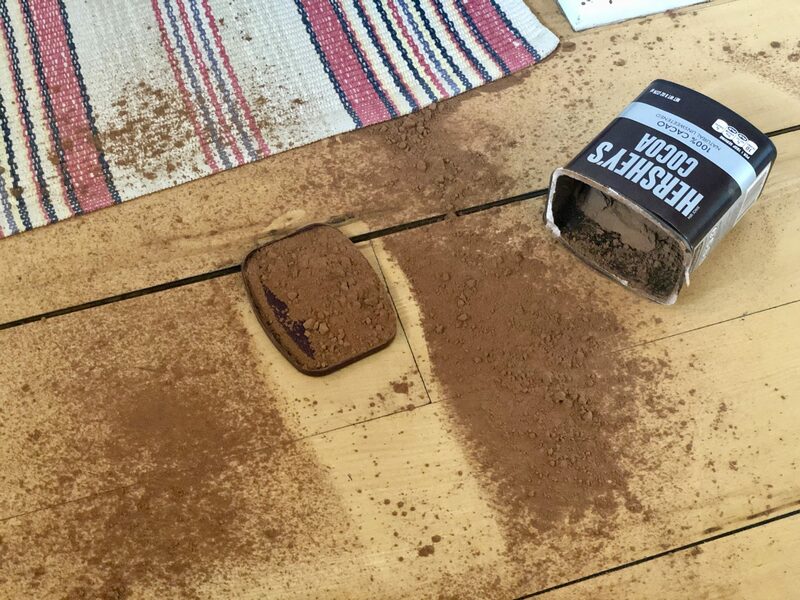 No use crying over spilt milk－or cocoa powder as the case may be…even if you’re wearing new white canvas sneakers! 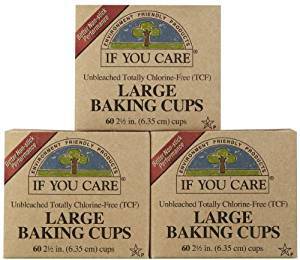 I’m partial to parchment paper cupcake liners. Cupcakes, muffins, and egg recipes made in muffin cups pop peel away easily with not a speck of sticking. Hershey’s Cocoa Cake is a family favorite cake alternative. This made me cry, thank you so much for sharing! I lost my mom four years ago at 23 and it feels like yesterday. Hi Ann – What a beautiful tribute this is. I wept reading this thinking of Emma losing her mom so young but heartened by her ability to remember her Mom with love thru food. Your website is not just a reflection of what a great cook you are but also what an amazing and compassionate friend you are. Your comment is so heartwarming, Julie. 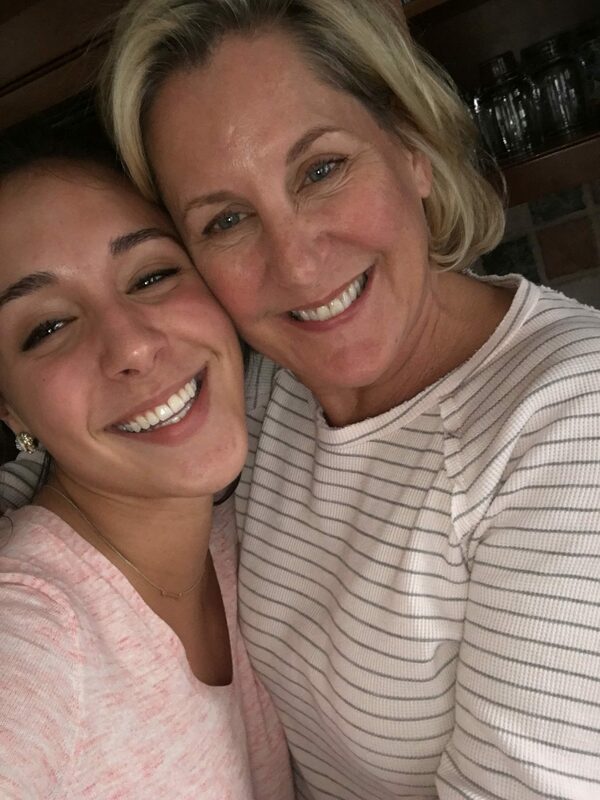 As a mom and a daughter, I find Emma to be an inspiration on so many levels and feel fortunate for the special connections between our families. Love it ❤️ Thank you for this! Ruth was my one of my best friends from both high school and college in Iowa. She was both a southern belle and an Iowa Hawkeye rolled up in to the same person. She was a wonderful story teller, which she learned from her mother, who was also a wonderful and colorful story teller. I spent many a day in their kitchen just listening to tall tales from the past. Emma, your mother continues to shine down on you with her love and I know some day you will fill your daughter’s head with the stories that you shared with your mother. Ann, Your comment adds such a wonderful perspective and I love how the threads of storytelling and time in the kitchen wind their way through the generations. Emma and her sisters will no doubt keep this legacy alive and well! What a lovely mother-daughter story! So sad she lost her so soon in her life, but how precious are her memories. One of my families favorite cakes is the chocolate cake with caramel frosting. I thank you for giving the substitutes for the flour, and the butter in the frosting. I have considered using your gluten free flour blend, but always hesitated thinking it might turn out differently than desired. Now I know I will try it and am assured it will be fine. Thank you for your comment, Dotti. Memories are a precious thing, and Emma’s photos feel like a special window into a few of them. 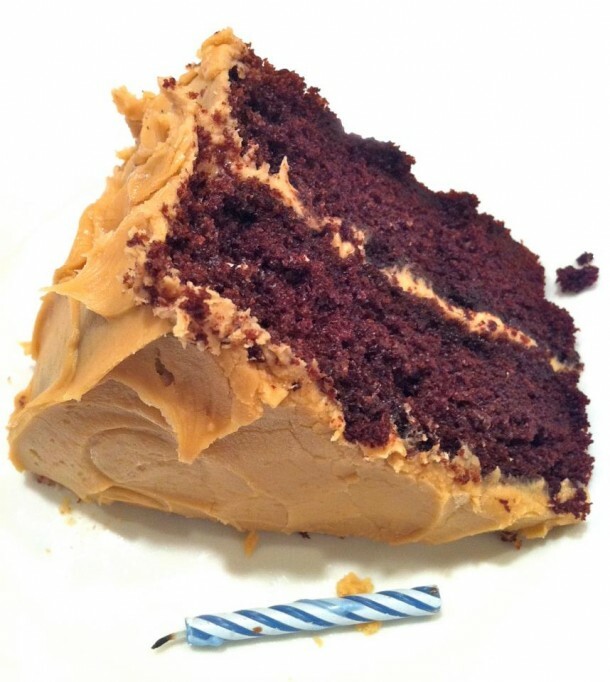 So glad your family enjoys the chocolate cake with caramel frosting as much as we do. I’m happy to give you the added assurance with the substitutions in case they’re needed! What a touching story to accompany this recipe. Makes it even better. Thanks for sharing. It’s so true, Chris. 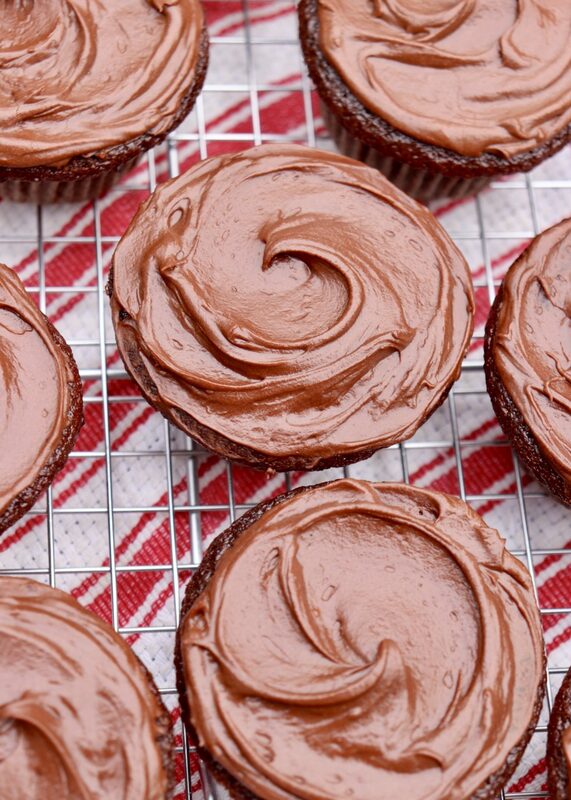 These cupcakes will forever taste extra delicious! Hi Ann, Have you tried Sweet Potato ganache? 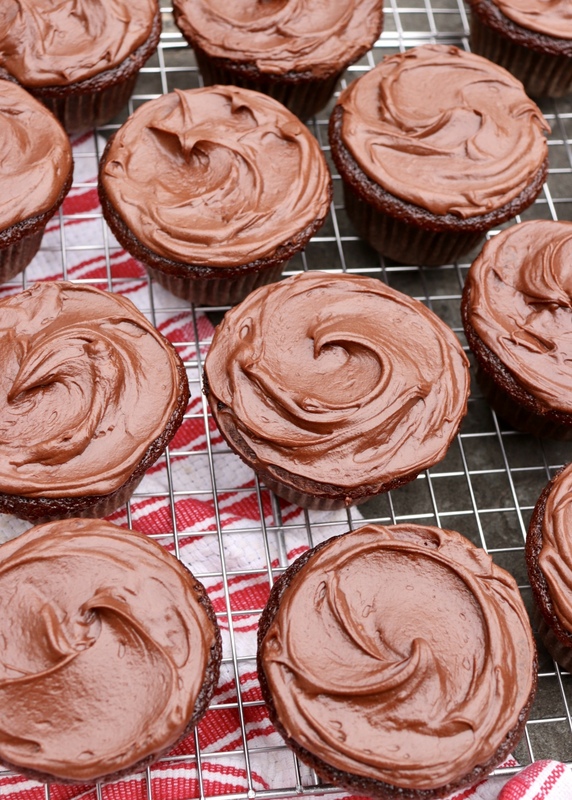 I have used it many times in place of chocolate frosting and it is always a hit. Two ingredients, sweet potato and semi-sweet chocolate chips. I haven’t, Jane, but I’m intrigued. How much of each do you use? Feel free to share details. I’d be happy to try it and I bet other readers would as well! Thanks, Seth. She was a special lady! In my searches for a family chocolate cake recipe- this recipe is a good match- everyone agreed that “the cupcakes tasted like Nan’s”. So easy to make! a winner and we are continuing to share the love in it! Yay! Your comment makes me so happy, Judy. Thanks for spreading the love! I’m excited to try this, as I have gluten-free co-workers and are always looking for new recipes to share. So nice of you to think of them, Michelle. I’m pretty sure they’ll love it!